I was on location on April 30 and May 1, 2013 filming background and witness interviews for the Jimmie Robinson story. How many people have the clout to get the First Baptist Church in their town to erect a monument to their deceased son right smack dab in the front of the historic church (originally built in 1789)? A woman who lives in this house did. How many folks have the clout to get the local newspaper to publish inaccurate stories? How many folks have the clout to get charges covered up accusing their son of sexual abuse? In Sevier County Tennessee, it seems the rich folks get what they want in court and with the police, and the poor folks are denied justice. Rich folks' kids don't get arrested, but poor folks' kids do. It seems rich folks' sons can sexually abuse their children, but a falsely-accused poor folks' son goes straight to the slammer. The story of Jimmie Robinson is one of the system failing to do what it is supposed to do, and in this case, it resulted in the death of a young man. In my opinion, Sevier County killed Jason Hicks. Jimmie Robinson admits that he pulled the trigger, but it was after he and his family did everything they could possibly do to protect a three-year-old boy from abuse by his biological father. I have interviewed witness after witness and have reviewed reports that would cause any honest person to conclude that Jason Hicks was a sick man who was abusing his son mentally and sexually. The local newspaper refuses to print the truth. I look forward to telling the real story. So you are in a trial. There is one witness against you, and he's an attorney and a liar. During a break from the trial, the judge and the star witness for the prosecution are smoking together in an alcove beneath one of the entrances to the building. The judge rules against you and sings the praises of the lying attorney. How mad would you be? Wouldn't that be grounds for the judge to recuse himself and the judge's ruling to be vacated? That's exactly what happened at the hearing for a new trial in the case of Jimmie Robinson. 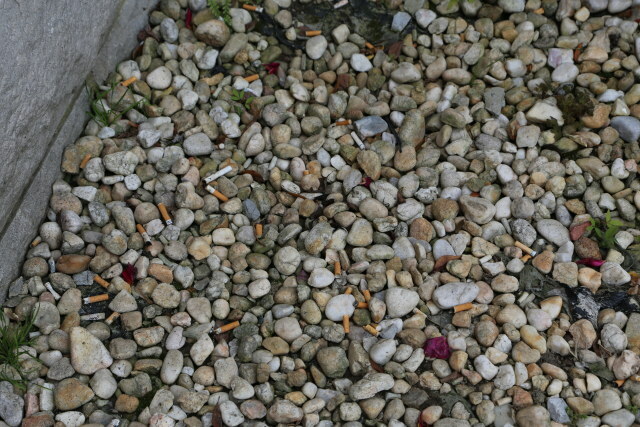 These are cigarette butts that I picked up from where Judge Richard Vance and attorney Bruce Poston were smoking. Poston even bummed a cigarette off the judge. Now ex parte contact is a big no-no, but between the judge and the star witness in the middle of a trial, I don't believe it gets any worse. And there's more. Star witness, lying attorney Bruce Poston, was also observed talking with other witnesses outside the courtroom after all witnesses were instructed that they could not discuss the case. Mr. Hickman, Jimmie Robinson's court-appointed attorney, had better file a motion to get the judge disqualified and the order set aside. The ruling was an outrage to justice. I know; I was there, and I know the truth about what happened and why. It's Day 321 for Lawless America...The Movie. A significant number of people are scheduled to be filmed in Sevierville, Knoxville, Jackson, and Memphis over the next few days, and I will be visiting four prisons to film stories. Can you even believe that the State of Tennessee Prison System has decided it will not allow me into any of the prisons to film? I'm told it's for security reasons. But others get to film inside. It's clear to me that it's for the purpose of concealing as much as they can about the horrile INjustice in the state of Tennessee. I will definitely be visiting Jackson and Biloxi Mississippi; New Orleans and Baton Rouge Louisiana; Houston, San Antonio, Austin, Dallas, Fort Worth, and a few other towns in Texas. I am keeping my schedule flexible, so I don’t have to push myself so hard. It looks like I will be in Jackson Mississippi on May 8, Biloxi Mississippi on May 9, New Orleans on May 10 and 11, Baton Rouge on May 12. With two new medications, the infection I develoepd from oral surgery seems to be clearing up. I'll be fine. It's 2 am and I am still working. This project is relentless.